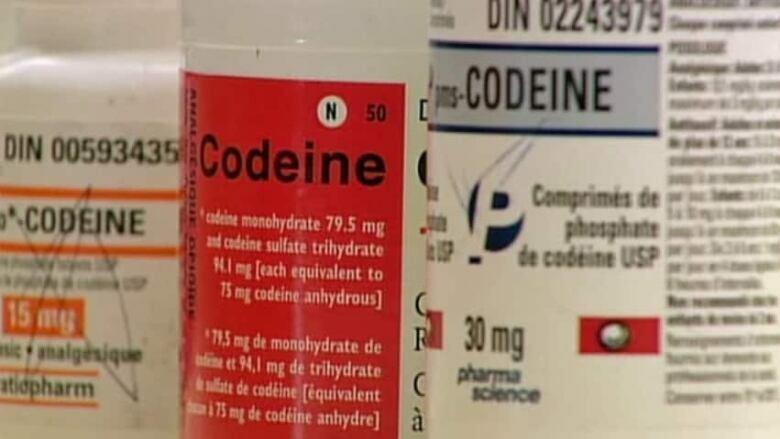 Anyone under 18 should not be given cough and cold products containing opioids, such as codeine, after a safety review found early opioid use "may be a factor in problematic substance use later in life," Health Canada says. Cough and cold products containing opioids, such as codeine, should not be given to young children or adolescents, Health Canada recommends. Young children and adolescents should not be given cough and cold products containing opioids, such as codeine, after a safety review found early opioid use "may be a factor in problematic substance use later in life," Health Canada says. In an advisory issued Monday, the federal agency said "as a precautionary measure," those under 18 should not use products containing codeine, hydrocodone and normethadone — the three prescription opioids authorized to treat cough symptoms in Canada. Health Canada said the safety review of cough and cold products "did not find any strong evidence linking cough and cold products that contain opioids with opioid use disorders in children and adolescents," but found "early use of opioids may be a factor in problematic substance use later in life," the advisory says. The agency also found there is "limited evidence" to support the effectiveness of these products in those under 18, noting other products are available to help relieve cough and cold symptoms in children. The U.S. Food and Drug Administration (FDA) changed its guidelines for such medication last year, saying the "risks ... outweigh the benefits" for those under-18. Health Canada noted the use of prescription cough and cold products with opioids has fallen among children and adolescents over the past five years: youth prescriptions represent only about four per cent of the total dispensed in Canada. Non-prescription products containing codeine are already labelled to make it clear they should not be used by children. Health Canada is also asking manufacturers to update their product safety information to reflect the recommendation.